It’s hard to be a fan of January. Dead of winter, nothing growing in the garden, and it gets dark so early. I urge the sun to speed up and get back to us, I try to will it. It will won’t do any good of course but it makes me happy now that it is still light out when we walk the dogs. We’re getting there. I don’t suffer from SAD but as I don’t do caffeine having the bright sun helps boost me out of bed. I ordered my seeds the other day and I hope they arrive this week so we can start some this weekend. It’s a real treat to see the little sprouts pop up and show off their green. Another step closer to spring and away from the hibernation feel I get when the days close in. 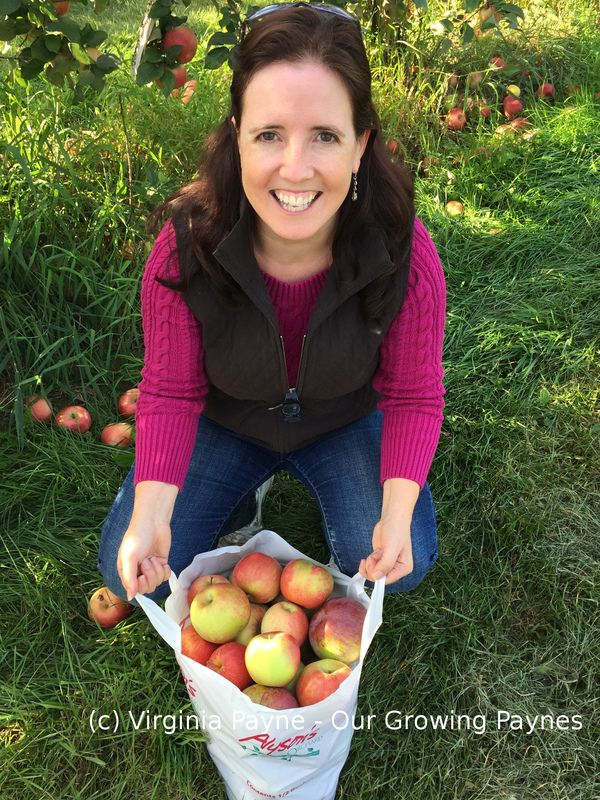 Last winter lasted a long time and ate into the growing season. Fingers crossed we get out of this deep freeze in a timely manner! I’m an avid pinner on Pinterest and I realised if I’m pinning all this stuff it might be a good idea for me to go back and see what I have. I came across Nigel Slater’s Coq au Riesling. It was one of those pins I set aside and forgot about which is a shame because this is delicious. I changed it of course to be more like what we enjoy and I was very pleased with it. I’ve been finding several recipes lately that rely on an acid quite a bit and I feel that just would be one noted and overpowering in these recipes. I will say right out of the gate, this is not diet friendly. I think next time I’ll back off the butter a smidge. In a large skillet melt about 50g of butter and a bit of olive oil. When it’s nice and hot start to brown your chicken thighs. I’ve been buying ours skinless and boneless but obviously you can use bone in and skin on. 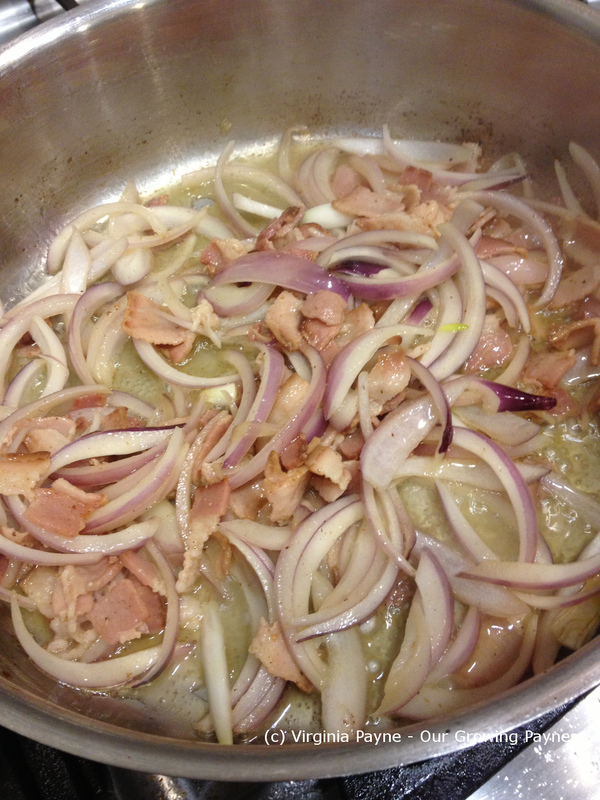 As they are browning, chop up several slices of bacon, half a red onion, and some garlic. Remove the chicken and set aside. Render the bacon for a few minutes then add the onions. After they have a chance to soften then add the garlic. 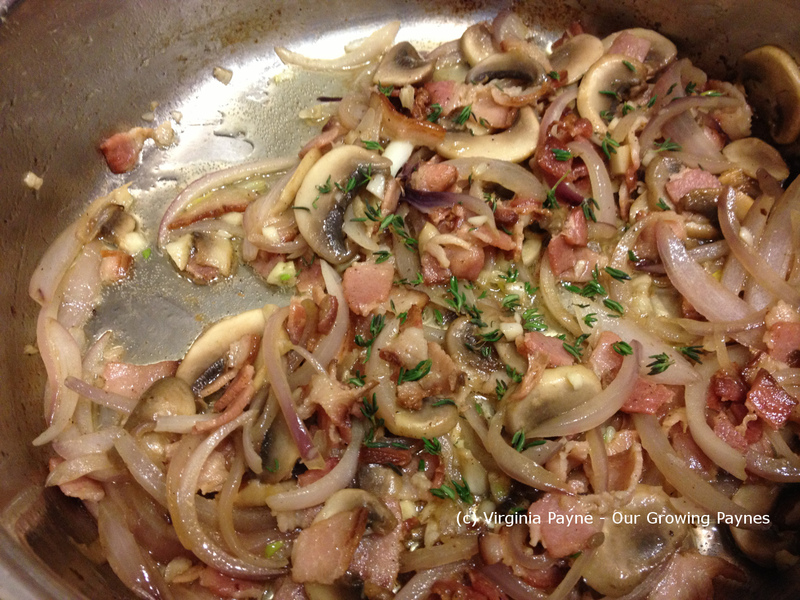 Slice some mushrooms and prep some fresh thyme and add it to the skillet. 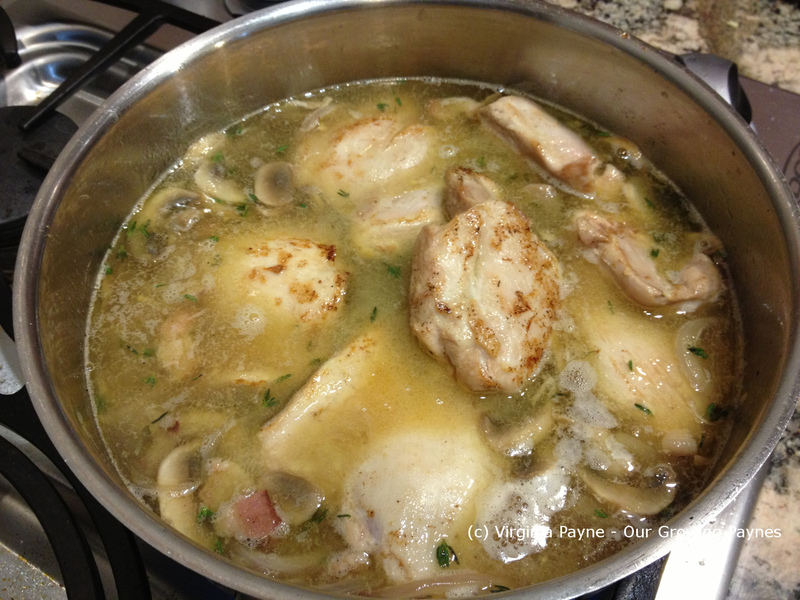 After the mushrooms have a chance to brown a bit add about a cup of riesling and a cup of turkey stock. I didn’t want to have it all wine as I felt that would be way too much. I picked a riesling on the dry side as I don’t enjoy really sweet wines. Bring to a simmer and add the chicken back in. 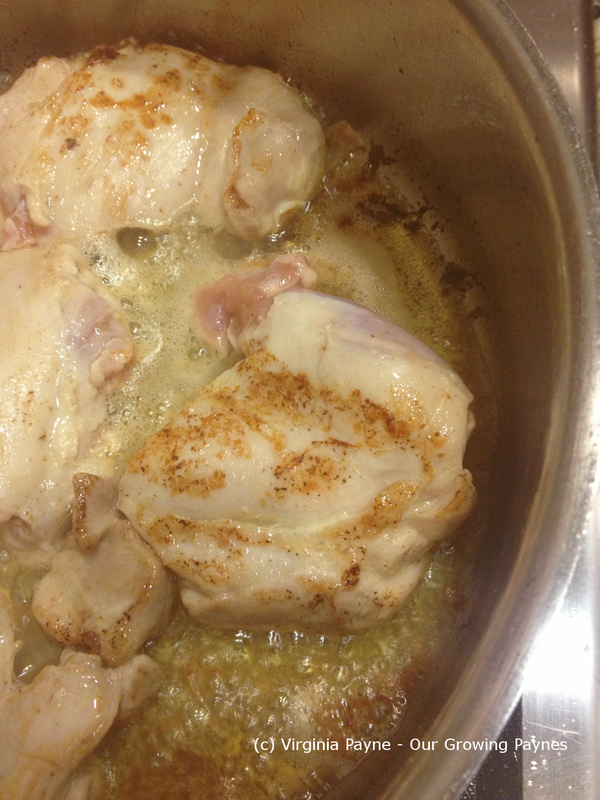 Let it simmer for about 20 minutes or until the chicken is cooked. Add salt and pepper to taste. Add about 1/2 cup of heavy cream and heat through for a few minutes. It is ready to serve. I served it with roasted potatoes and roasted parsnips. I have to say this was an amazing dish. Worth busting the diet a bit. I do think, as I said, I will back off on the butter as it proved to be a lot. I’ll have to make it when the kids are around as I know this would be a hit. 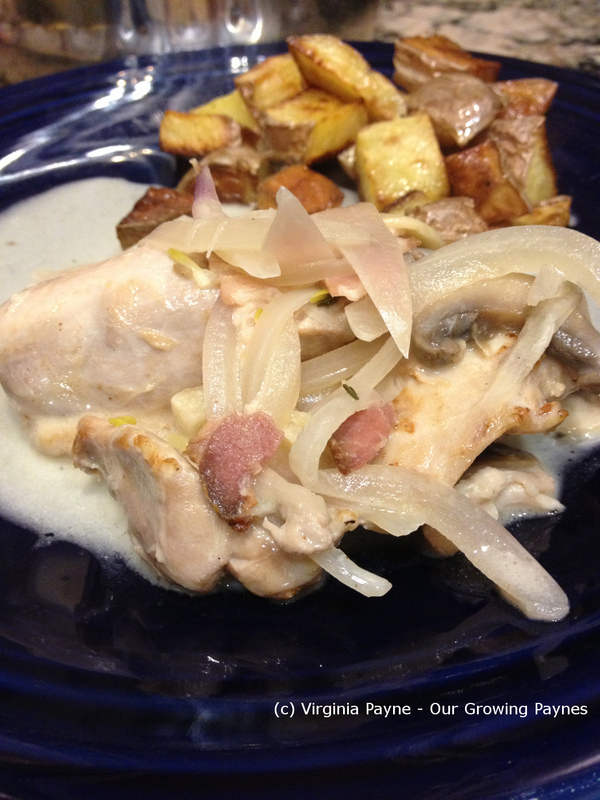 This entry was posted in French Recipes and tagged butter, chicken, cloves of garlic, cooking, coq au riesling, dinner, food, mushrooms, Onions, riesling, salt and pepper, thyme. Bookmark the permalink. That sounds so good! You can’t beat comfort food in the winter. Anything to make us feel warm! That looks incredibly good. I am going to give that one a try, I have a roaster chicken I can section for this. On another note, I just started using Pintrest… how do you get followers? are you even supposed to have followers? Help I am very confused. If you want to promote your blog it helps to have followers there. Pin your posts to help drive traffic. I started Pinterest so I had a spot to organise the recipes I liked and gardening stuff before I started blogging. If you pin good content you’ll find followers plus when you follow others it will help to direct them to you as well. It can be addicting at first! Thanks for the tips. How can I find you on Pintrest? You have a great blog here. I found your board. 🙂 And thank you, I’m glad you like it. This chicken looks beautiful! And I love Riesling ! Wow that is a lot of butter, great tip to reduce it. I hope you update the post with the adjustment when you make it again. The Riesling sounds like an interesting change on an old favourite, I can just imagine how tasty it is. The winter in Toronto is also cold and long, but at least the sun is staying up loner into the afternoon. I think I would half the butter. But it does depend on people’s tastes. Some would reduce it further and some would say more butter! The flavour, no surprise, was really good with all that butter but not healthy. Love this dish….even better made with a really fruity Gewurztraminer.